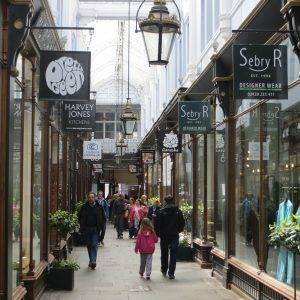 This walk gives you just about everything you could ever wish for from a city walk – fabulous architecture both old & new, seafront and river, two great parks, lots of independent shopping. 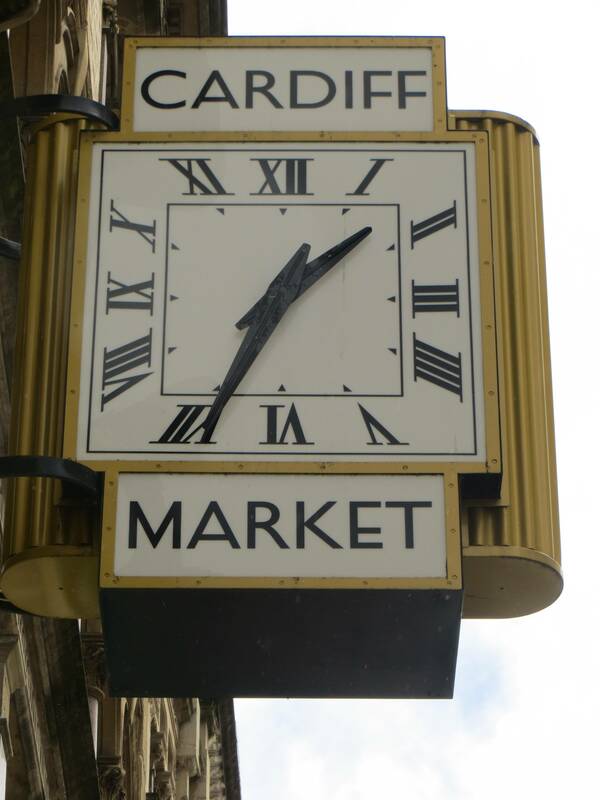 City status: Cardiff was made a city in 1905, and proclaimed the capital of Wales in 1955.
Notable city architects / planners: Alexander Roos (1810-1881), architect to John Crichton-Stuart, 2nd Marquess of Bute. Cardiff’s setting on a flat, marshy plain at the mouth of a river surrounded by hills, not far from the South Wales coalfields, has defined its basic structure. 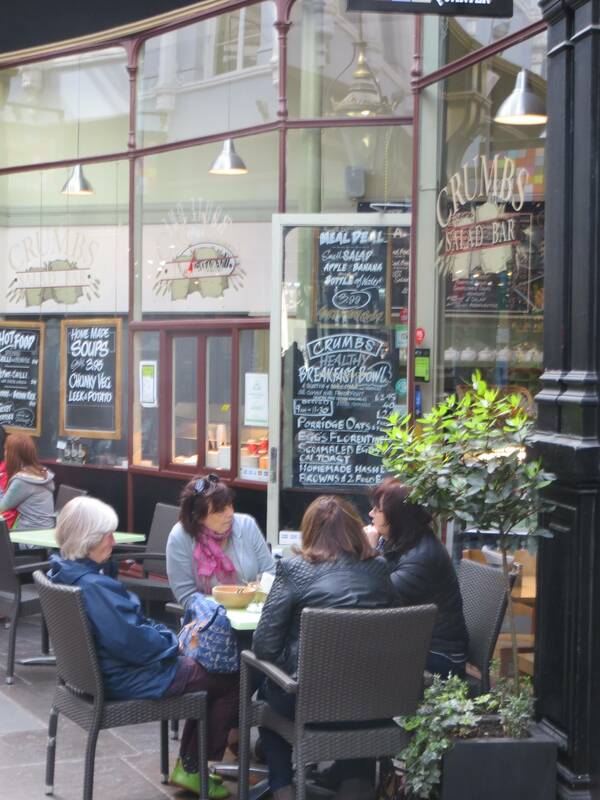 Cardiff, perhaps more than any other city in the UK, demonstrates how a city can be turned around through regeneration. From having been the largest coal-exporting port in the world, the docklands area had become derelict by the 1980s. But by the 1990s the area, re-named Cardiff Bay, was being transformed with the construction of the Cardiff Bay Barrage. 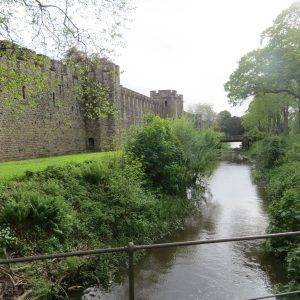 The name Bute is never far from the story of the city, for it was the Bute family who extended the castle, developed the docks and gave Bute Park and Roath Park to the city. After the natural geography, they have had the largest influence on the shape of the city; the second Marquess, builder of the docks, is often described as “the creator of modern Cardiff”. My elder son was interested in going to Cardiff University to study economics (he ended up in another chapter), so it seemed like a good idea to go and take a closer look at the city. Whilst he practiced being a student by staying in bed oblivious to the outside world, I snuck out really early to see the city before it filled up. But one is never alone in a city, that’s one of the things I love about city walks. 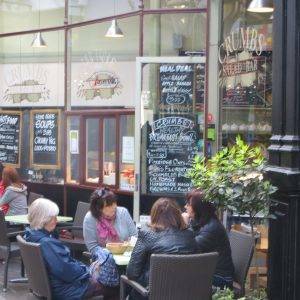 When I popped into a café for a quick cup of coffee and a bacon sandwich, a group of bin men were sitting at the table next to me having something to eat before getting going cleaning up the city centre after a busy Saturday night. It’s a reminder that a city never sleeps. According to a notice fixed to one of the bins in the pedestrian area just outside, the council spends more than £7Mn a year on street cleaning. What a shame we can’t all be a little tidier and spend the money instead on our parks and green spaces which are currently subject to major financial cutbacks. In much the same way that the Cardiff Bay area has, so Cardiff Castle has been through several regenerations of its own. Originally a Roman fort, it became a Norman stronghold before being transformed into a Gothic fairytale fantasy by the Victorians, a fabulous example of gothic revival. St John’s Churchyard Gardens, which I came to next, is an example of a small green space in the middle of a busy high street that offers a tiny handkerchief of calm. Someone on Yelp summarised the gardens neatly: “In among all of this bustling madness you can find a place to sit away from the main pedestrian traffic, street sellers and charity collectors. This is a place to let the city pass you by for a while.” Green spaces, however small, can make a measurable difference to the quality of life in a city. 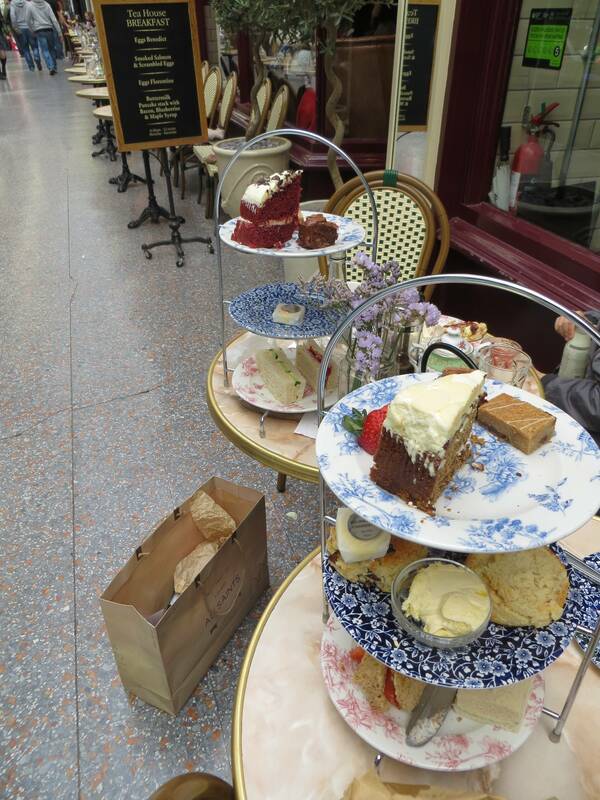 And you must pop in to The Cardiff Market, maybe just to pick up some fruit for the rest of your walk. 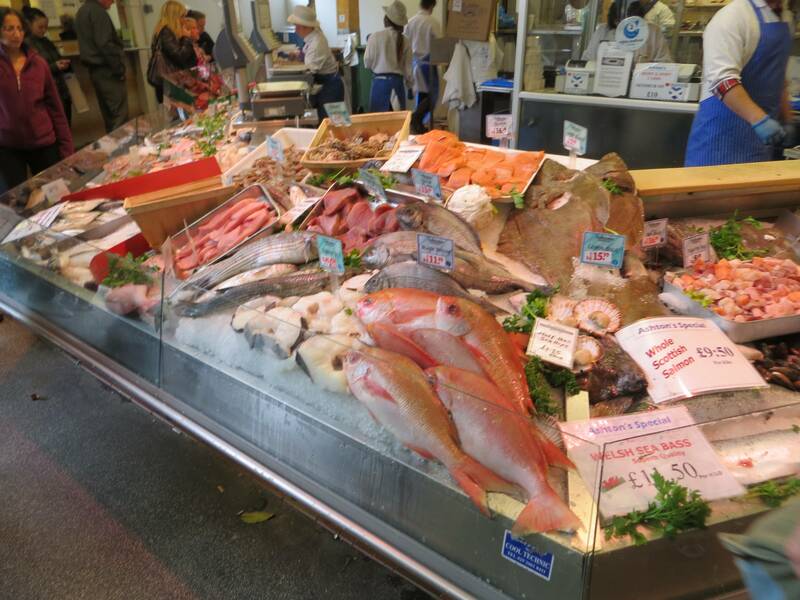 The Market Hall, dating from 1891, is an architectural gem, its stalls ranging from butchers, grocers and fishmongers to vintage clothes, second hand records, cafés, even a hairdresser. 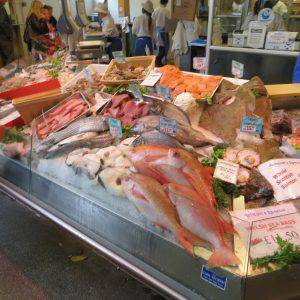 Ashton’s the fishmongers has traded continuously on the site since 1866. You will love this place, lots of unexpected finds, with some real characters on the stalls dishing out friendly banter to each other and the odd customer. 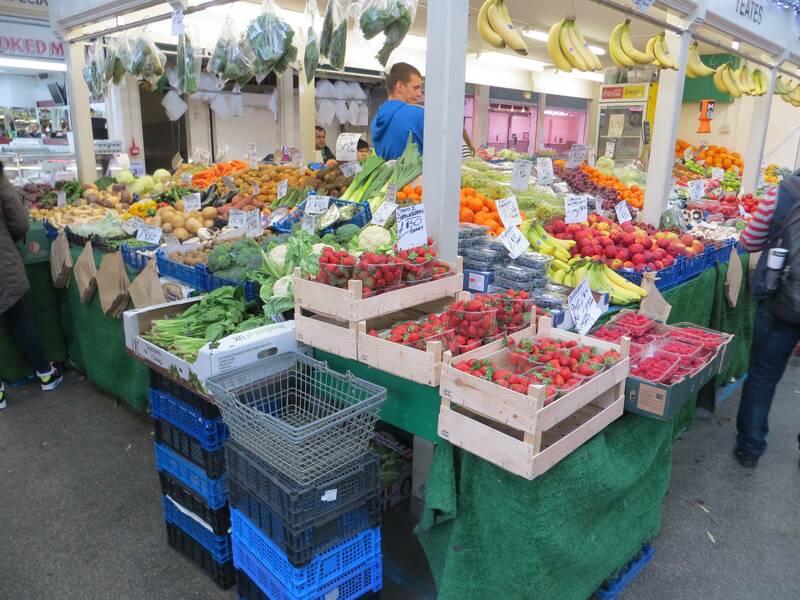 Nothing like a market to bring life to the heart of a city. 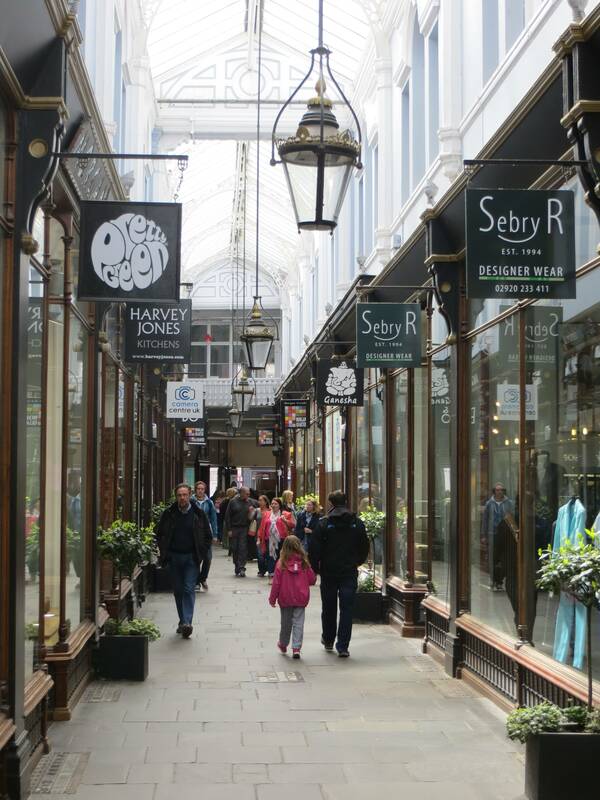 Next I turned right through Morgan Arcade to St Mary’s St. Now is probably not the time to stop and take a look around, but you will certainly want to come back later. The Arcades, of which there are eight in total, follow the lines of the old alleys and lanes of the medieval town. Each arcade has its own character, but the Morgan Arcade (1896) is amongst the most notable and well-preserved with its original wood-framed shop fronts and Venetian windows on the first floor; as is the L-shaped Castle Arcade (1887), which has three storeys at one end and a cast-iron bridge linking its balconies. Interesting architecture, with lots of nooks and crannies, seems to go hand in hand with quirky, fun shopping rather than the dull uniformity of a modern high street. Heading down St Mary’s St, I was then sucked into the rather characterless ‘no man’s land’ between the city centre and the Bay, which has no doubt flummoxed many a tourist as to wether it’s a walkable distance and whether there is anything interesting to look at en route. Well, I eventually concluded that the most interesting way is probably via Callaghan Square and the Canal Park. In 2002 Bute Square was renamed Callaghan Square in honour of former UK Prime Minister (and Cardiff South and Penarth MP) Lord Callaghan. It was developed as part of a Private Finance Initiative scheme to link central Cardiff with Cardiff Bay. In the centre is a statue of the 2nd Marquess of Bute. Canal Park was created on top of the filled-in Sea Lock Pond and canal, a vital link between the sea and canal network from the late 18th Century onwards. Wharves were built to transfer iron and coal from the canal boats to the larger, ocean-going vessels that came into the Pond through the Sea Lock. From being a key spur to Cardiff’s economic success, trade down the canal dwindled in the 20th century and, after an accident destroyed the Sea Lock in 1952, it was closed down permanently and filled in. Now a long, narrow strip of green space which is popular with locals, its interesting history seems largely forgotten, although there is a canal mural at the southern end. Before the Coal Exchange was built in Mount Stuart Square, the area had been a residential square with a central garden. It was taken over by commerce as the city grew in propserity and became the biggest coal port in the world. The Exchange was constructed in the 1880s by Edwin Seward as a base from which to conduct trade negotiations regarding the coal mines of the South Wales Valleys – most of which shipped their coal to Cardiff for distribution. Following its opening, coal owners, ship owners and their agents met daily on the floor of the trading hall to do business. In its heyday the price of the world’s coal was determined here; and apparently the first ever £1,000,000 business deal was made here during a transaction in 1901. Inevitably Cardiff’s dependence on coal made the Bute Docks highly vulnerable to any downturn in the demand for it. With the end of the Second World War the docks went into terminal decline. The Coal Exchange shut its doors in 1958 and coal exports finished for good in 1964. Roald Dahl Plass, which used to be a dock, is named after the children’s author, who was born in Cardiff. The bowl-like shape of the space makes it a popular amphitheatre for hosting open-air concerts. “Plass” means space in Norwegian, a nod to the author’s roots (both of Dahl’s parents were from Norway) and to the Norwegian Seafarers’ Church which stands nearby, where the author was christened. People love the space. It hosts a number of events through the year, notably a food fair and a beach complete with sand, paddling pool, fairground rides and side shows. In between times there’s plenty of room for kids to let off steam. One Trip Advisor comment sums it up neatly: “We were lucky to have a sunny day, the open space allows thinking time, space to play, cycle, play football. We sat and enjoyed the sun and people watched.” A new space in a city that really works to bring people together and interact in a positive way. The Plass is also a place of pilgrimage for Dr Who and Torchwood fans, with many episodes having been filmed here. The Millennium Centre, alongside the Plass, was built with local materials to celebrate the different geological zones of Wales. The centre’s main feature, the bronze-coloured dome, inscribed with verses in Welsh and English, is clad in riveted steel, reflecting South Wales’s industrial past; whilst the multi-coloured layers of slate represent the stone layers in sea cliffs from the slate quarries of the north. The Senedd (senate), the debating chamber of the Welsh assembly, constructed in 2006, was similarly built with local materials including slate and Welsh oak. The building was designed to be as open and accessible as possible; in the words of the architects, the Richard Rogers Partnership, “The building was not to be an insular, closed edifice. 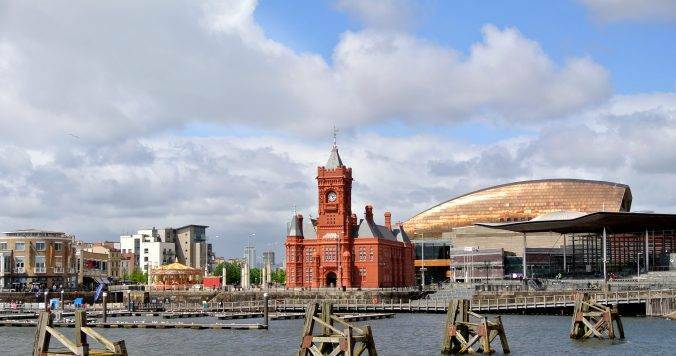 Rather it would be a transparent envelope, looking outwards to Cardiff Bay and beyond, making visible the inner workings of the Assembly and encouraging public participation in the democratic process.” I like that ambition of bringing the outside in and vice versa. Another building with a rich patina of history is the Lutheran Norwegian Church, built in 1868 as a place of worship for the Norwegian community in Cardiff. In the 19th century, Cardiff was one of Britain’s three major ports, along with London and Liverpool. The Norwegian merchant fleet at the time was the third largest in the world, and Cardiff became one of the major centres of its operations. The church was built to serve the religious needs of Norwegian sailors and expatriates. Clad in iron sheets on the instruction of the Harbour Master, to allow it to be moved if necessary, the contingency turned out to be a stroke of genius when it was easily re-located from the space subsequently occupied by the Millennium Centre during the regeneration of the bay. It is now an arts centre and café, and makes a very welcome break. The walk turns round on itself just beyond here and now you hug the side of the bay, passing by the Cardiff Bay Wetlands Reserve just on the other side of the St David’s Hotel. A number of bird species including Reed Buntings, Reed Warblers and Sedge Warblers use this habitat. 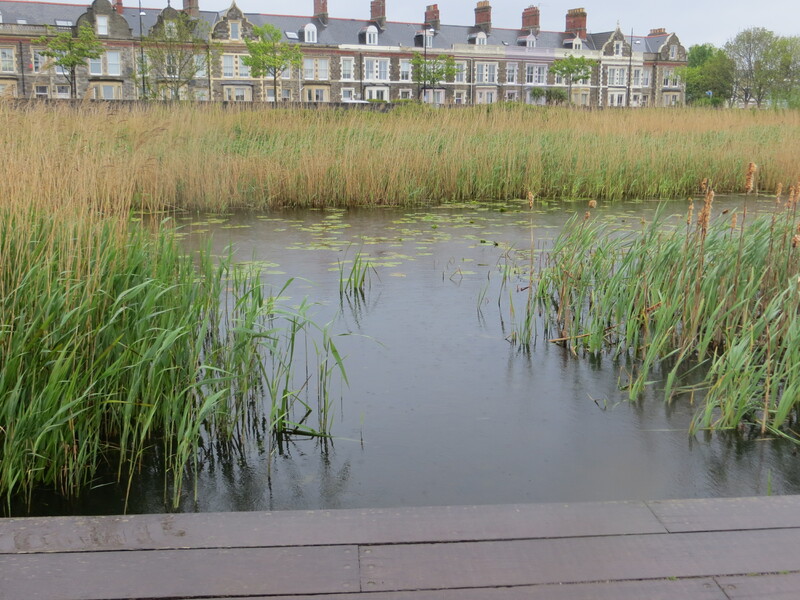 Hamadryad Park, north of the Butetown Link Road, was salt marsh and inter-tidal mud flats until the closure of Cardiff Bay Barrage in 1999, which created a 198 hectare freshwater lake. It is now used for sports and dog-walking. Crossing the Clarence Rd Bridge, the path tracks up the western side of the River Taff, and I got a great view of the Millennium Stadium in the distance. Being a rugby fan, I felt I could almost hear the roar of the Welsh supporters urging their team on. The Millennium Stadium is really a very fine beast of a sports arena, and you get to walk in its shadow along the Millennium Walkway, passing over the flags of all the countries that have ever played there. Even if you only have a little feeling about rugby, this is a truly amazing stadium! The Millennium Walkway, 750metres, provides pedestrian access along the riverside without reducing the available stadium space. For those of a nervous disposition, walking over a rapid current, it is re-assuring to know that the structure was designed to carry a Class 1 Fire Appliance, so we should be fine. 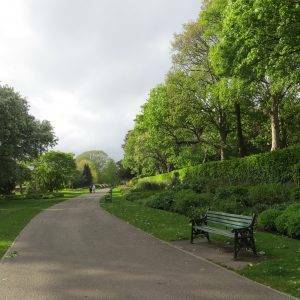 Few cities have such a spacious green area in the heart of their city as is the case with Bute Park & Arboretum (53 hectares, 130 acres), comprising historic landscape, urban woodland, sports pitches, arboretum, horticultural features and a river corridor. 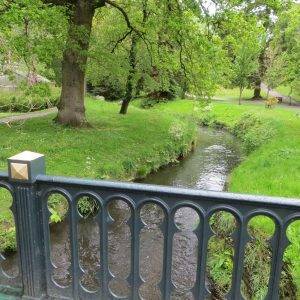 The park was laid out as a private pleasure garden for the Bute Family by Andrew Pettigrew between 1873 and 1903. 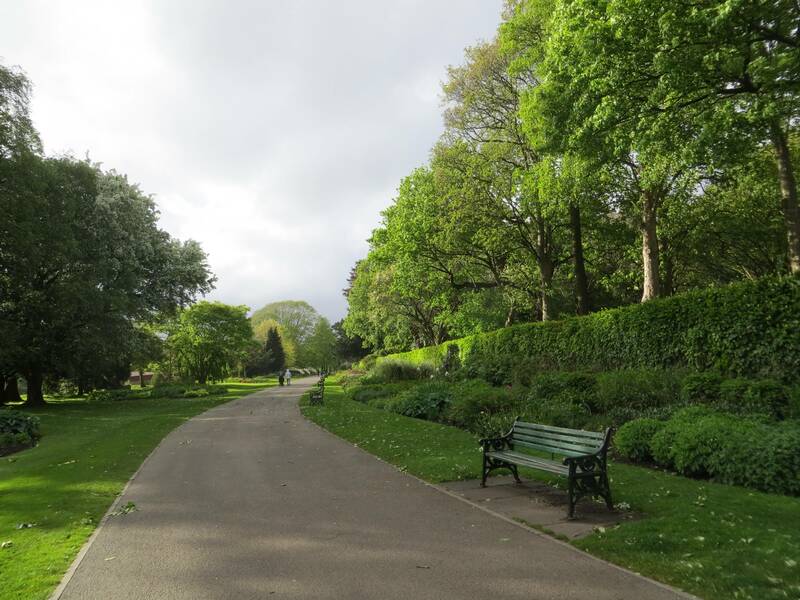 In 1947, the fifth Marquess of Bute presented the park to the people of Cardiff, and it is now managed by the Council and is a ‘green lung’ of the city, with more than 2,000 trees. 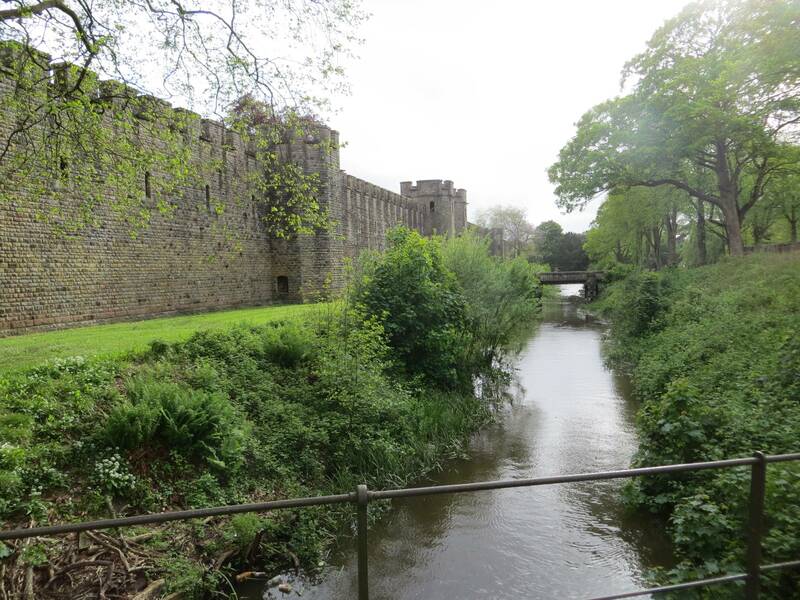 The park contains a wealth of historic remains dating back to Roman and medieval times; including Cardiff Castle, the Animal Wall, the Gorsedd Stones and the 12th cenury Blackfriars site. From Bute Park I cut niftily across the city (OK, not the most scenic part of the trip), to reach the northern entrance to Cathays Cemetery (45 hectares, 110 acres), the third largest municipal cemetery in the UK. 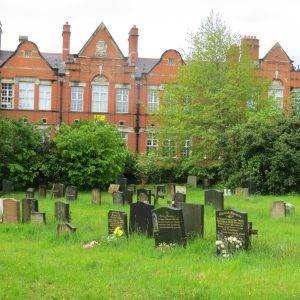 Opened in 1859, it was intended both as a place of burial and a pleasant environment in which to walk. 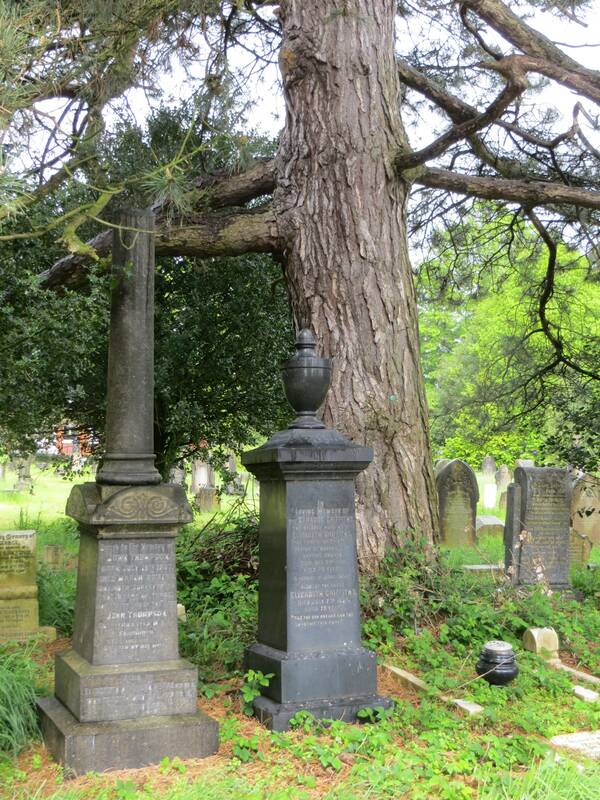 And with refreshing practicality, the different denominations – Anglican, Non-conformists and Catholic – each had their chapel of rest but shared the cemetery, albeit they each had different burial areas. 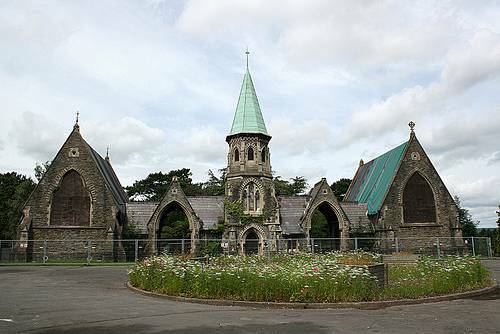 Sadly the Catholic chapel had to be demolished in the 1980s, and the other two are in urgent need of repair, a task which the Friends of Cathays Cemetery are supporting. 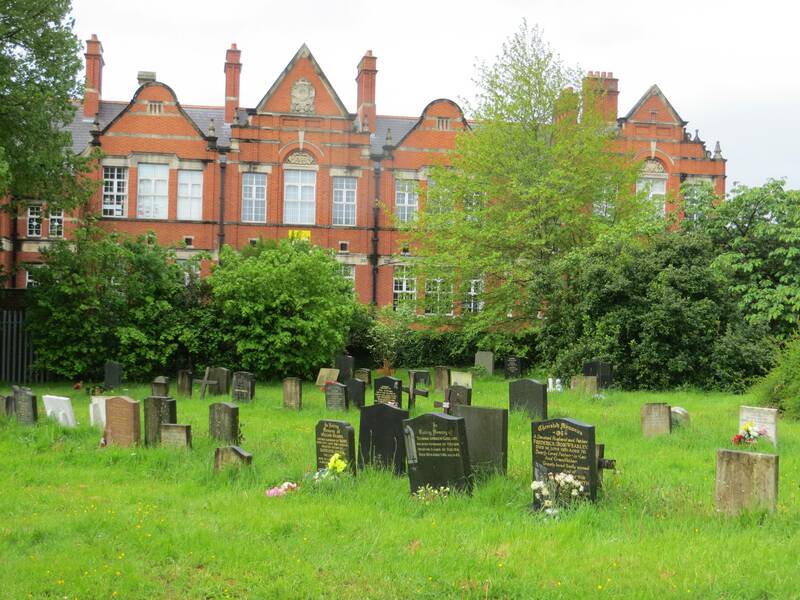 This is a reminder of the huge challenge of green spaces in cities – who is going to fund them? 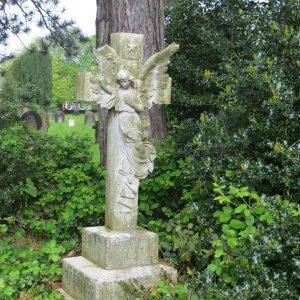 This is especially true in cemeteries, which many people are reluctant to visit or are unaware that they generally welcome the general public to stroll around, delve in to the local history that they present, enjoy abundant wildlife or just while away a pleasant afternoon reading a book. 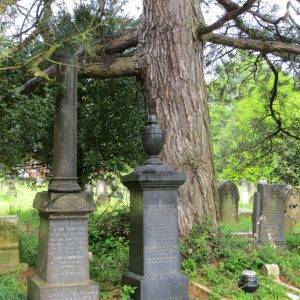 This is one of the finest cemeteries that I have walked through and, on a sunny day, an absolute delight. The Cemetery Office (which unfortunately you won’t reach until your exit) has a useful map which will point you to some of the most notable graves, chronicling the famous military, community and commercial figures of the 19th and 20th century, including Andrew Pettigrew, the gardening brain behind Bute Park. I duly paid my respects to the great man. 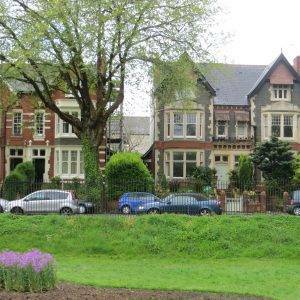 The land for Roath Park (53 hectares, 130 acres) was donated by the Marquis of Bute (him again) to the city in 1887, and officially opened to the public in 1894. Work initially focused on creating the lake from an area of marshland. 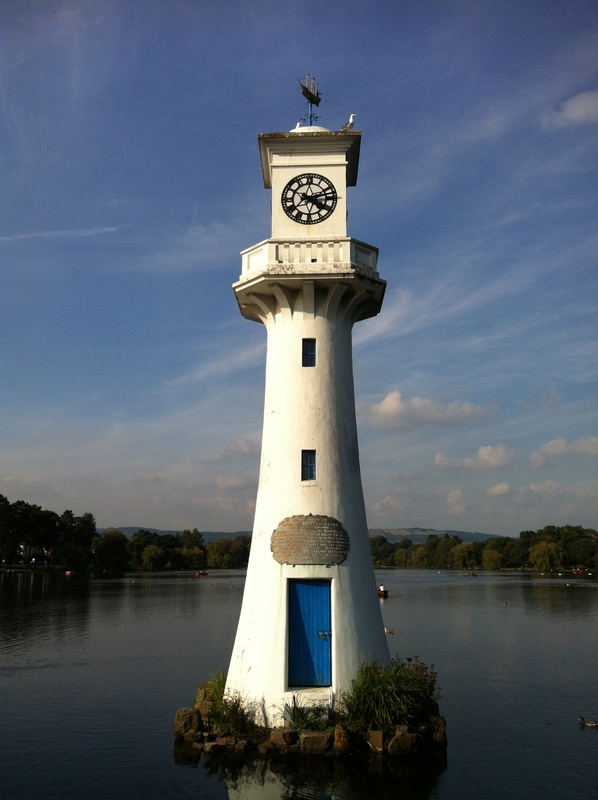 In 1915 a lighthouse was added in the lake, containing a scale model of the ‘Terra Nova’ ship to commemorate Captain Scott’s ill-fated voyage to the Antarctic from Cardiff in 1910. The park’s atmosphere today still retains the Victorian elegance and its status as a Conservation Area ensures these qualities will be conserved. Moving south east from the park, I followed the Roath Brook as it flows through the Roath Pleasure Gardens, Roath Mill Gardens and finally reaches Waterloo Gardens (which is a slight detour from the main route). These are all fine examples of Edwardian parks; well designed and with a distinct aura of years gone by. 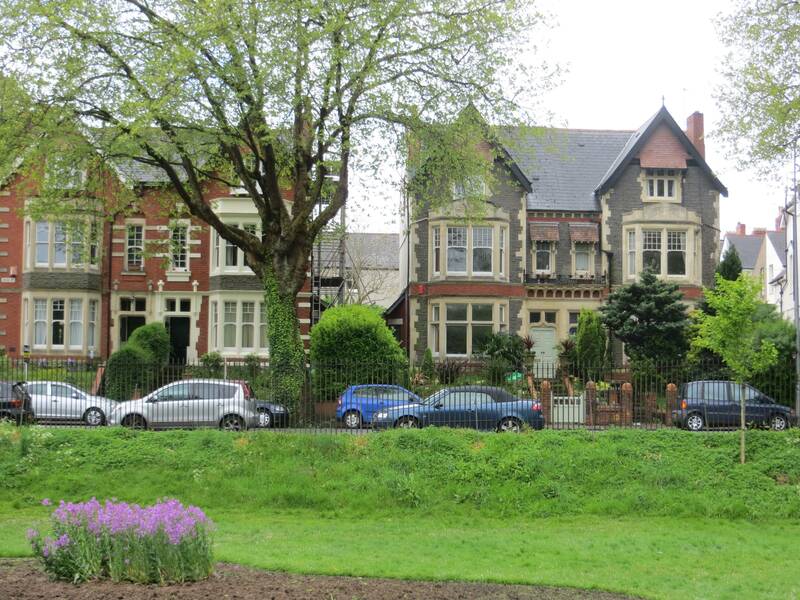 If I lived in Cardiff I would love to live in one of those Edwardian villas overlooking the brook. 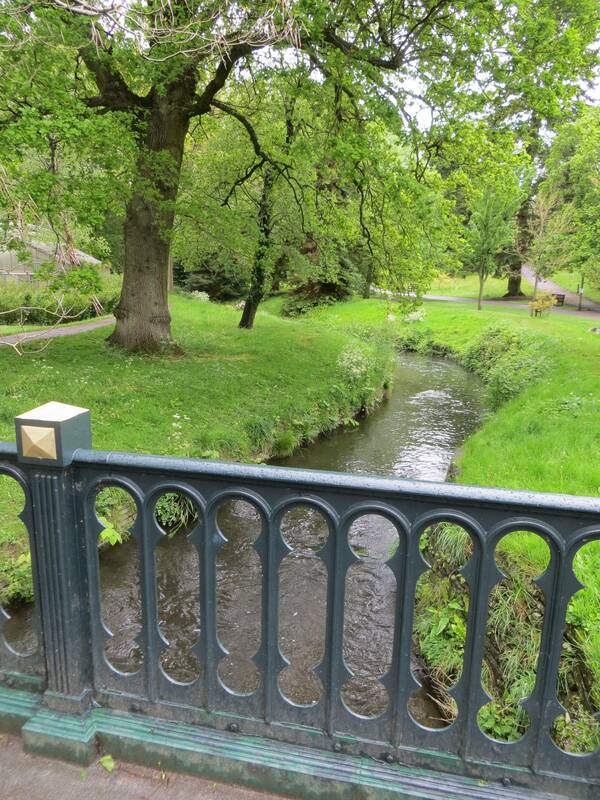 The mix of trees, streamside plants and formal ornamental planting make the parks very attractive and full of interest. The route back to town is through some of the town’s less affluent streets and a fair smattering of student properties. Then suddenly I find myself back on the Cathays Park University Campus, with some very striking buildings dating from the early twentieth century. The Welsh Government Building on the north side of Alexandra Gardens is a classic late 1930s building, very striking; whilst the earlier (1909) main university building on the east side is a good example of the Beaux Arts style. Finally I came out on Gorsedd Gardens. 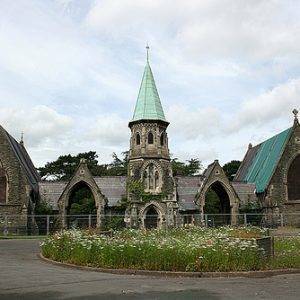 Situated in front of the National Museum, this garden has as its centrepiece a stone circle constructed in 1899, when the National Eisteddfod of Wales was held in Cardiff. The garden’s name refers to the Gorsedd of Welsh Bards, the ceremonial order that governs the Eisteddfod. From here’s it’s a short hop back to the start point at Cardiff Castle. Surely my son will be out of bed by now and we can pop down to the arcades for brunch?! Proceed to the SE side, past the City Hall on your righ, through Gorsedd Gardens and so back to the start point at Cardiff Castle. The Norwegian Church Arts Centre and Café, Harbour Drive, Cardiff Bay, CF10 4PA (Tel: 029 2087 7959, www.norwegianchurchcardiff.co.uk) is a great spot to relax and enjoy the view. Waterloo Gardens Tea House (if you take the small diversion ay Waymark 14), 5 Waterloo Gardens, CF23 5AA (Tel: 029 2045 6073, www.waterlootea.com) is “committed to an ongoing exploration of the world’s finest teas” and definitely merits a visit. Fish at 85, 85 Pontcanna St, CF11 9HS (Tel: 029 2002 0212 www.fishat85.co.uk) Essentially a fishmonger’s with a few seats for diners, this very appealing little restaurant keeps everything simple. Not on the route. Without any hesitation, head straight to The Arcades. 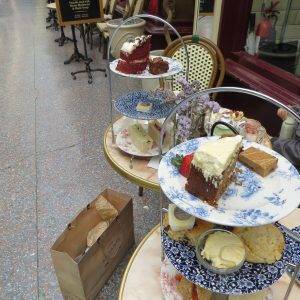 These are full of surprises, lots of different types of shops and myriad cafés too. 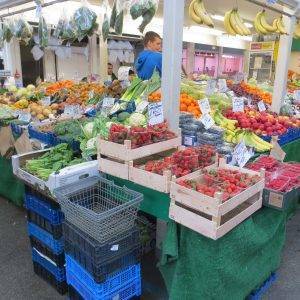 The Central Market, near the start of the walk, is another place that you must try and get to. Cardiff Castle, Castle Street, CF10 3RB (Tel: 029 2087 8100, www.cardiffcastle.com) Cardiff Castle’s walls and fairytale towers conceal 2,000 years of history, from Roman origins to lavish 19th century Gothic interiors. Cardiff Museum, Cathays Park, CF10 3NP (Tel: 029 2039 7951, www.museumwales.ac.uk/cardiff) houses Wales’s national art, natural history and geology collections, as well as a history of Cardiff. There’s plenty to please the eye, from superb Impressionist paintings to gigantic dinosaurs. 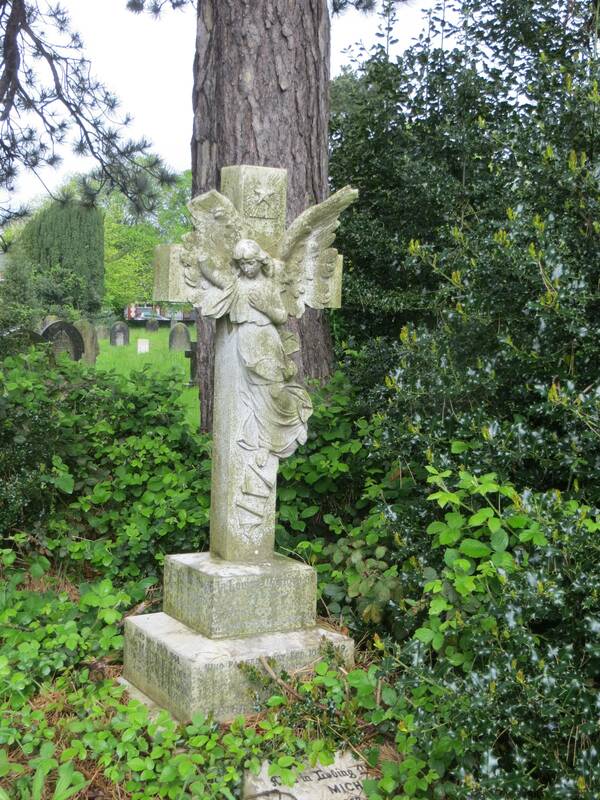 Doctor Who Cardiff Walking Tour [Unofficial]. 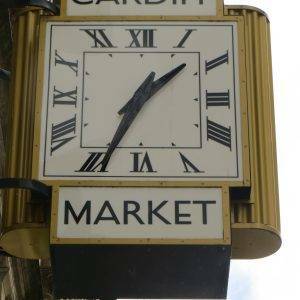 With Cardiff being the home of Doctor Who since the show returned in 2005 you will get to visit over 30 filming locations around Cardiff city centre and Cardiff Bay. 2.5 hour tour.